A laugh-out-loud, visual romp from the acclaimed author-illustrator of A Bit Lost and Shh! We Have a Plan. In this hilarious read-aloud by the multiple award-winning author-illustrator of A Bit Lost and Shh! What will George do now? 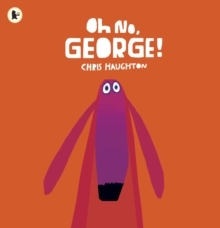 Shortlisted for the Kate Greenaway Medal and the Roald Dahl Funny Prize, Chris Haughton's distinctive artwork perfectly accompanies the innocent charm of affable George, a dog trying to be good - with hilarious results!